This Green Bean Quinoa Salad with Maple Citrus Dressing is totally crave-worthy and can easily be made in advance for a tasty holiday side dish that’s sure to impress! Somehow my bathroom scale found it’s way into the kitchen. Let me rephrase that: my two year old dragged my scale from it’s banishment under the dark corner of my bookshelf into the kitchen, a mere 2 feet from the pantry door. She’s connived it’s a toy. I know better, of course. It’s evil. But now there it lies: silently judging me on the way to the pantry. It taunts me when I reach for a second bowl of cereal instead of a banana, and practically screams at me when I poke around for the chickpea’s stash of Halloween candy. Currently we’re at a bit of a standstill. I’ll be the first to admit that I’ve put on a few pounds since the surgery and a bit more during the move, and the peer pressure this tiny electronic emits isn’t the end of the world. I sort of like it. Of course it’s more of a love/hate sort of like. The same way you may enjoy a really terrifying movie or the weirdly intoxicating smell of permanent markers. That. I also kind of want to drop something really really heavy on it. Whoops! That case of pumpkin just flew right out of my hands! Maybe we’ll forget to pack it during our next move or an overzealous kitchen dance party will render it airborne, flinging it into the nearest wall, or with any luck, directly into the trash can. I’m pretty sure its days are numbered. In other news, this recipe won’t tip the scale, not the slightest bit. In fact, you may earn yourself a pat on the back for this one! Green bean quinoa salad FTW! Oh, and in case anyone doubts the effectiveness of having one’s scale in the kitchen, I’ll have you know that today I ate an entire sliced cucumber with carrot-ginger dressing as a snack instead of the mini Milky Way bars I originally went in there for. I ate the candy after. This healthy winter salad is totally crave-worthy and can easily be made ahead of time, making it perfect for the holidays. Even better? It won’t take up prime oven real estate like traditional green bean dishes so you’ll be able to save space for turkey and stuffing. This Green Bean Quinoa Salad with Maple Citrus Dressing is totally crave-worthy and can easily be made in advance for a tasty holiday side dish that's sure to impress! Rinse quinoa in a mesh strainer and cook according to package directions. While your quinoa cooks, trim green beans, cutting each in half. Set aside a medium bowl of ice water for your ice bath. Fill a pan with water and set to boil on high. Once water is at a rolling boil, add green beans and cook for 5-8 minutes or until they reach your ideal tenderness. I like mine al dente; softened but still crisp! Drain and immediately submerge beans in ice bath to halt the cooking process. While the beans chill, fluff your quinoa and add a dash of salt and pepper, to taste. In a serving dish, combine quinoa with beans, along with orange segments and chopped almonds. Whisk together dressing and pour over salad. Allow salad to sit and soak up dressing for optimal flavor. I left mine for 30 minutes but since the salad and dressing are dairy-free, you could even leave it out for longer. Top with feta and optional parsley to garnish before serving. Enjoy! I typically blanch my green beans but feel free to cook them via your favorite method. Roasting or sautéing are both delicious options! Light olive oil or grape seed oil will also work with this recipe if you don't use avocado oil. Though do yourself a favor and try it sometime - it's healthy and delicious! If you don't have maple syrup handy either, honey may be used instead. Love lime? Serve alongside a lime and a grater for an optional zing of lime zest! ADVANCE PREP TIPS: If you're making the salad the morning of your holiday meal with friends and family, you can simply leave the completed salad out with the dressing on it to soak up all the flavors. Save a little dressing to pour over just before serving and add feta before serving as well. If you're making this a day or two in advance, cook up your quinoa and green beans as directed. For best results both visually and flavor-wise, I suggest keeping everything in separate containers in the fridge (the nuts can stay in the pantry) and then toss together and add dressing/toppings an hour or so before serving, allowing the salad to return to room temperature and the flavors to meld. Lengthy description; easy peasy execution! So flipping delicious! 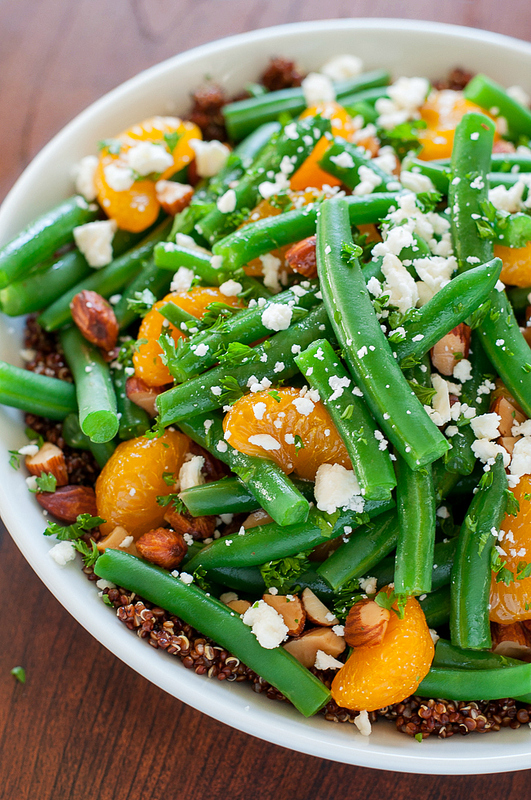 We’re loving this sweet and savory green bean quinoa salad! It’s one of those salads that tastes better and better as it sits in the dressing and I could not stop going back for more! It’s 100% going on the menu for Thanksgiving this year and I cant wait! 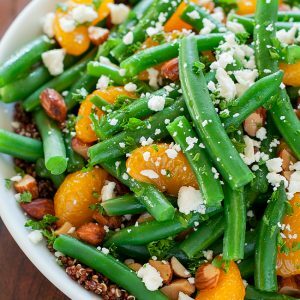 The dressing is light and citrusy and a perfect compliment to the fresh, crisp green beans, juicy oranges, and nutty quinoa. The roasted almonds add the perfect amount of crunch to the salad and the feta makes the cheese addict in me very happy. To say I’m obsessed with this flavor combination is putting it lightly; I can’t wait to play it up in more dishes this season! 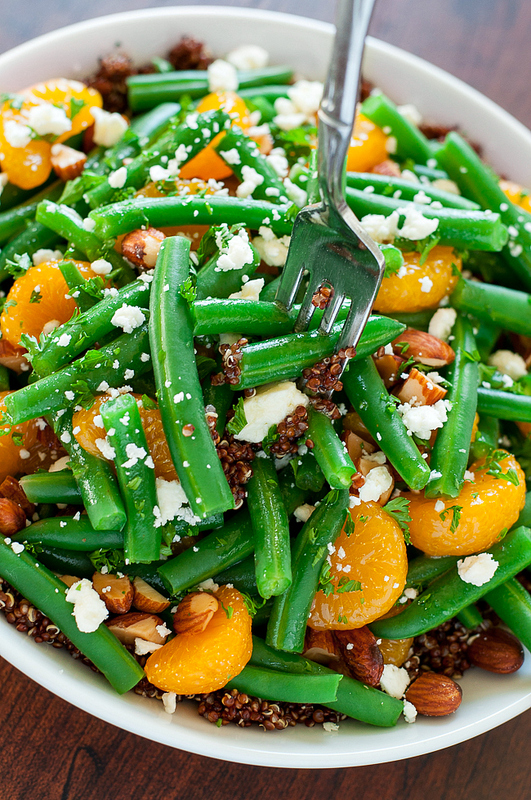 Love this salad, check out my easy peasy Greek Green Bean Salad next! This looks truly delicious! Great idea to add some mandarin parts to a salad. And I’m inspired by you eating a cucumber with ginger dressing! I tend to eat cucumber with a little bith of hummus, but this sounds like an awesome alternative! Thanks for the tip!